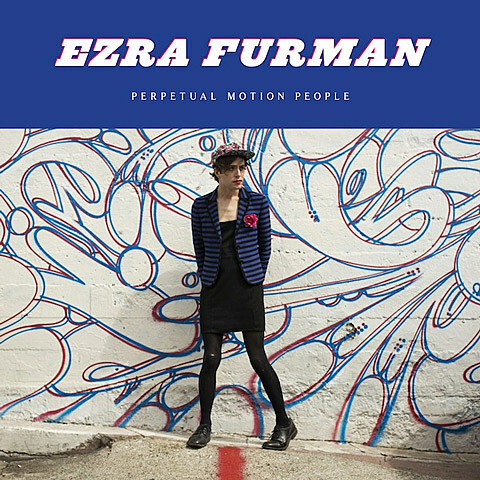 Ezra Furman defies easy categorization, actually singing “let’s wreck all these preconceived notions” on “Ordinary Life,” one of the standout cuts from his new album Perpetual Motion People that dabbles in folk, doo-wop, distorted rock, and hooky guitar pop. (He is also orthodox Jewish and publicly identifies as queer and genderfluid.) The record is worth checking out and you can stream the whole thing via Spotify below. Copies of Perpetual Motion People sold at Rough Trade come with an exclusive five-song covers EP, featuring takes on Beck’s “Devil’s Haircut,” Melanie’s “The Good Book,” The Replacements’ “Androgynous,” The Arcade Fire’s “Crown of Love” and an affecting, acoustic version LCD Soundsystem’s “I Can Change.” That LCD cover makes its premiere in this post and you can listen below. Ezra and his band start a short US tour tonight (8/5) in NYC at Rough Trade with J. Fernandez and Emily Einhorn. Tickets for that show are still available but if you’d like to go for free we’re giving a pair away. Details on that and a list of all Ezra Furman dates are below. And speaking of LCD Soundsystem, James Murphy will DJ at Output on August 14 with Eric Duncan. Tickets for that are on sale. For a chance at winning a pair of tickets to see Ezra Furman at Rough Trade: either tweet something that includes both @BrooklynVegan AND “Ezra Furman at Rough Trade” in the tweet, or send an email to BVCONTESTS@HOTMAIL.COM with the subject line “Ezra Furman at Rough Trade”. Include your first and last name in the email. We’ll pick a winner at random and contact them with more details. If you enter by email, it will not be shared with anyone else. Good luck!